In Ethiopia, Ambassel Music and Video Shop perservered throughout the bitter '70s and '80s - through political repression, curfews and civil war - to produce some of the most memorable artists and music of the time. 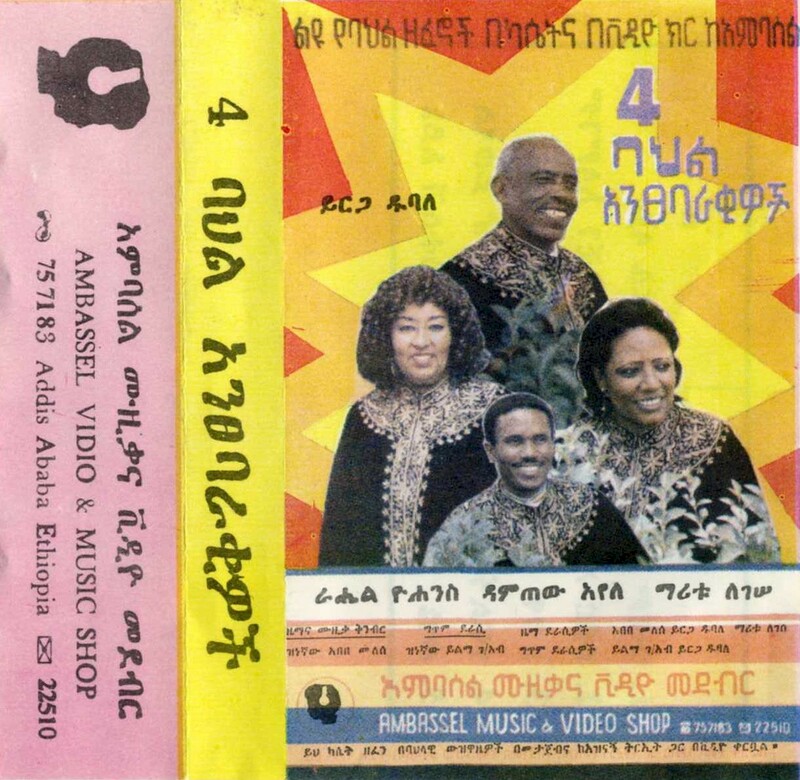 In the early '90s, after the fall of the Dergue regime, it emerged intact to issue this great selection of Ethiopian "cultural music" - 4 ባህል አንፀባራቂዎች - 4 Bahel Anshabarakiwoch ("Four Cultural Stars"). Yirga Dubale, an iconic masinko player, raconteur, and poet, left a lasting musical legacy when he died from nerve damage last week aged 82. Over the course of his career, which spanned more than 60 years, Yirga strived to broaden the exposure of Amharic folk and patriotic music with an intensely communicative style. With current of lyricism that expresses solidarity with the poor, he had an active role in preserving and promoting the Gondar’s Azmari tradition. Born in Koza Belesa of Gondar region in May, 1929, Yirga developed an interest in music at an early age. His father, Likke Mekuas Dubale Negash, was a celebrated music player who demonstrated to his son the deep pleasure of music. Yirga started playing maskino (a violin-like instrument) at an early age of ten. At twelve, he left his family and headed to Gondar town, beginning an itinerant life. Over the next few years, Yirga honed his skills and began to make a name for himself performing in cabarets and public places. In 1947 the young musician came to Addis Ababa and joined the Armed Force Band but he was disappointed by the low pay and went back to Gondar. However, he was caught and made to return. He once said in an interview that despite all this, he was well-liked by members of the army and the imperial regime. “I was showered with gifts of guns and colts which I later sold for Humera and Metema merchants,” he said. Years later, Yirga spent a year in Asmara, singing at a bar in what soon became a popular draw on the city’s music scene. Among the audience members was a military general, Aman Mickael Andom, commander of the Third Division in the Emperor’s Army. He liked Yirga so much that he soon had him in a mission to inspire and cheer the fighting forces of the country. Yirga was taken to the far battle fields of Eritrea to chant for the army, receiving applauds. Days later, to his surprise, he found himself performing in front of the Emperor who came to greet the army in Mitistwa. The occasion was broadcast by radio and brought him tremendous fame. In 1971, Yirga was awarded the King’s First Class Order of Merit Award from Colonel Tamrat Yigezu. One of his achievements was forming a musical group in Gondar town, the Fasiledes Musical Group. As a much-loved teacher for years he taught many of today’s leading musicians. With the coming of the military regime, Yirga left the country and moved to Israel. The departure proved a fruitful move for the musician as he soon found himself performing in Israel, Europe and America for the expatriate Ethiopian audience. In 1991 he was back in Ethiopia to begin a gentle climb through the national music. He’s had many appearances in grand events. Unfortunately, a nerve breakdown eight years ago left the masinko player paralyzed, which he blamed on a betrayal of the business partner when he was trying to open a club in Haya Hulet area. A likeable man with a disarmingly easy-going manner, Yirga retained a large fan base. He was recently awarded Lifetime Achievement Award by the Gondar Development Association. He is survived by his wife, to whom he was married for 46 years, and his six children. Andreas writes about this song, "Gojjam Endet Nesh (ጐጃም እንዴት ነሽ)": "'Goğğam Әndet Näš" - 'Gojjam, How are You?' Gojjam is a province northwest of Addis Ababa, in one of the Amhara provinces (although there are also other minority groups such as the Awngi)." Another one by Yirga Dubale, "Yaberr Awdemma (የብር አውድማ)" Andreas writes, "It must be 'Yäbərra Awdəmma,' but the final vowel a of the first word is assimilated to the first vowel of the following word. I asked on my FB wall about the meaning and got a good answer. In fact, the whole phrase is 'anči yäbərr awdəmma' which means that a woman ('anči' is the female form of 'you') is compared to the bright or clear day when threshing is possible. The threshing place is usually in the open field. Thus the metaphorical meaning is that the girl compared to such a lucky day (when threshing is possible) is a very special one, a girl/woman who has been looked or searched for." 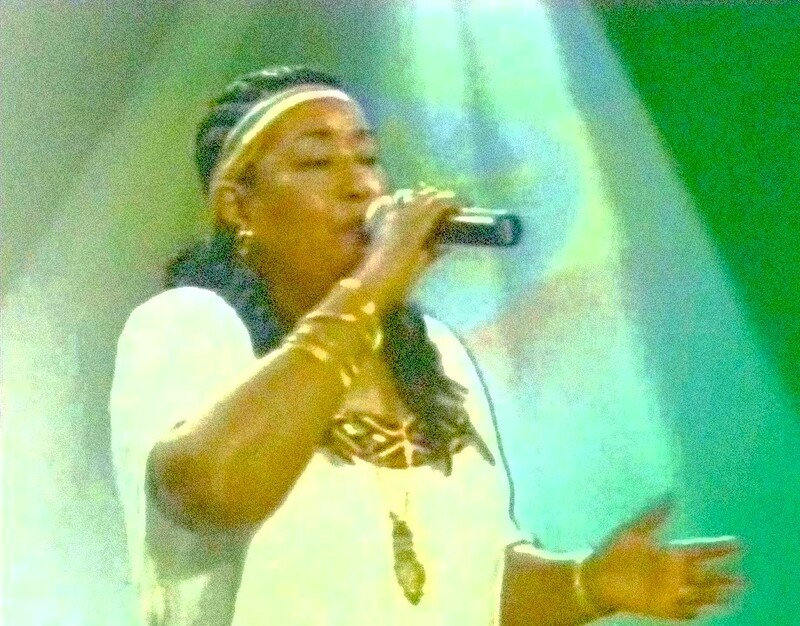 Maritu Legesse (ማሪቱ ለገሠ, below) has been dubbed Ethiopia's "Queen of Ambassel Music" and this song, "Zomawa (ዞማዋ)," is one of her most popular. According to Andreas, the title means, "Her wavy and long (i.e. beautiful) hair"
Rahel Yohannes (below), was the subject of a previous post on Likembe. 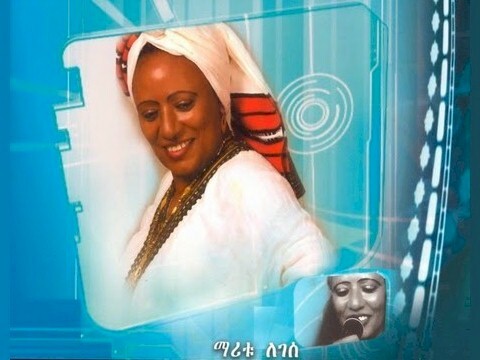 She has released many recordings in Ethiopia. The title of this song, "Tsaflenye Sälamta (ፃፍልኝ ሰላምታ)," means "Write to me a greetings." "Anchin Alamnem (አንቺን አላምንም)" (Ančin Alamnəm) = "I Don’t Believe You." "Abet Abet (አቤት አቤት)" = "Oh Dear, Oh Dear! Andreas: "መራዥ ይወዳል" must be "Märraž Yəwäddall Hode," meaning literally "My Stomach Loves a Poisoner." But "Märraž" has the meaning of "hero" or "brave man" in this context. "Hode," meaning "my stomach," refers to the person himself. The correct meaning is therefore "I love a brave man/hero." "Yekätalsh Ayne (ይከተልሽ አይኔ)" (Yəkkätələš Ayne) = "Should my eye follow you?" Download 4 Bahel Anshabarakiwoch as a zipped file here.